Where Do the World’s Wealthiest People Live? 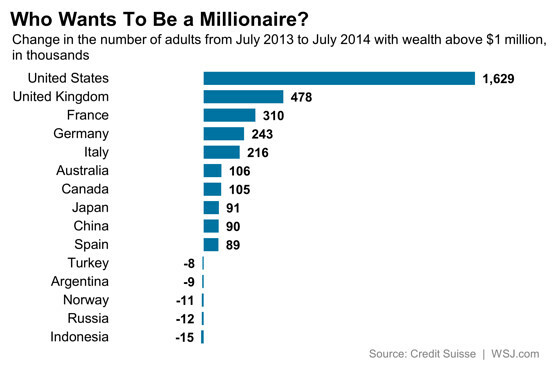 When it comes to producing millionaires, the U.S. still leads the pack. Between July 2013 and July 2014, the ranks of Americans with a net worth exceeding $1 million grew by 1.63 million, or more than one-third of the 3.84 million adults worldwide who saw their net worth exceed $1 million over that span, according to a new report on global wealth from Credit Suisse. Overall, the U.S. was home to around 14.2 million millionaires, or more than 40% of those in the world. After the U.S., the United Kingdom, France and Germany added more millionaires than any other countries last year. Of course, the U.S. has a lot of wealthy people because it’s a big country. But the analysis suggests that the U.S. is punching above its weight, even after accounting for population. Total wealth per adult increased by $340,340 in North America, or an increase of 10.2% from the prior year. Total wealth per adult grew by nearly $146,000 in Europe, an increase of 10.4%. By contrast, wealth per adult grew just 2.3% in China and it fell 1.9% in Latin America and 3.1% in India. The Credit Suisse report says you can probably thank rising stock markets for wealth gains in North America and Europe. Total global wealth hit a new record, rising 8.3% to $263 trillion, with the largest gains in North America, where wealth grew 11.4%, and Europe, up 10.6%. A few countries saw the ranks of the wealth drop last year. In Argentina, the share of adults with net worth exceeding $1 million fell by nearly one third to 18,000. Indonesia, Russia, Norway and Turkey also saw declines. What about the super wealthy? Credit Suisse estimates that there were some 128,200 individuals whose net worth exceeded $50 million, with around half of them living in the U.S. The ranks of these ultra-high-net-worth Americans increased 9,500 from the prior year, “an astonishing rise for a single year,” says the report. Indeed, the U.S. created more super-wealthy adults last year than the number of such millionaires that live in any other country. 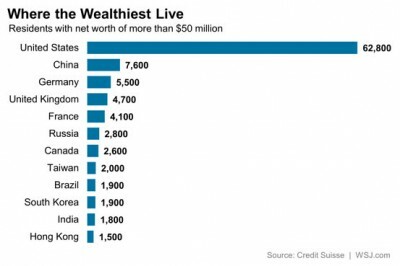 The next largest home of super-wealthy, China, had some 7,600 adults with net worth in excess of $50 million as of July.